In July, the Moose Pond Investors portfolio declined 0.13% while the S&P 500 increased 0.52%. Year to date, the portfolio declined 0.12% while the S&P increased 2.28%. The unit value of a share was $13.12 on July 31. The biggest gainers in July were Pfizer (PFE) +10.8%, Stryker Corp. (SYK) +8.1%, and Brown & Co. (BRO) +7.4%. The biggest losers were Capital One Financial (COF) -9.5%, Maxim Integrated products (MXIM) -8.5%, and Factset Research (FDS) -7.2%. The portfolio remains diversified with 25 holdings. 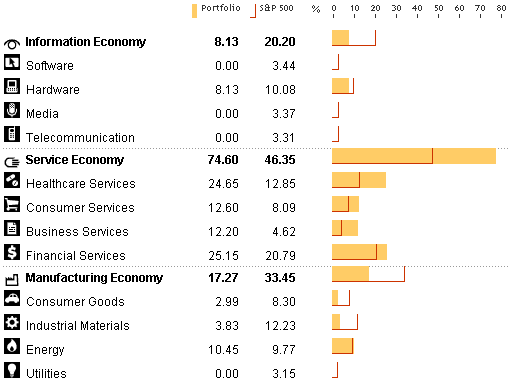 The following chart from Morningstar compares the sector diversification of the portfolio with the S&P 500. In adding to the portfolio, we should probably avoid further overweighting of the services sector. As the chart on the rights shows, the portfolio consists of large cap (57%), medium cap (38%), and small cap (65%) stocks. We should focus on finding more medium and small cap stocks. 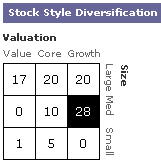 How did you create the portfolio diversification chart? The report came from the Morningstar “X-ray” report in their portfolio section. It may require a subscription to Morningstar to generate this report.